In order to allow system customizers to take advantage of the new forms introduced in CRM 2013, corresponding enhancements have been made to the form editor too. This will allow customizers to use these features while designing new forms as well as modifying existing ones. 1) A tab can have 3 Tab columns. 2) At a form level, a user can specify the max width in pixels. 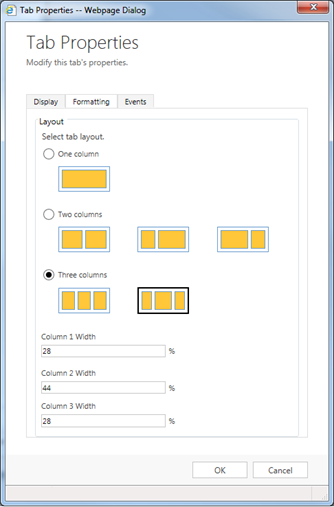 Using the Tab Properties dialog, the form editor is enhanced to support 3 tab column layouts. Previously 3 tab column layouts were possible only through the SDK, while the form editor was limited to supporting 1 or 2 tab column layouts. The reflow behavior is based on the concept of templates, which define the number of tab columns and the default ratio of widths. Templates are the starting point for users designing the form layout. The Tab properties dialog includes such predefined templates, based on best practices, as shortcuts to create tab structures quickly. The user can select one of the 3 options – One column/Two Column / Three Column, and the corresponding templates in order to provide pre-defined widths to the tab columns. The flexibility to provide custom widths to the columns is also provided using the Column width fields below. Corresponding changes have also been made to the Insert Ribbon in the Form Editor, which supports inserting tabs with the pre-defined templates. A new property Max Width has also introduced in the form properties dialog which defines the maximum allowed width of the form. Using these new features the responsive web design enhancements to Out of the Box CRM 2013 forms can also be used by the system customizers while creating new forms. For more information on customizing forms, see Customization Guide for Microsoft Dynamics CRM 2013 and Microsoft Dynamics CRM Online.